Internationalist Group contingent in March 28 Harlem protest the day after federal court decision against him. On March 27, a three-judge panel of the U.S. Third Circuit Court of Appeals in Philadelphia reaffirmed the frame-up conviction of Mumia Abu-Jamal, the former Black Panther Party spokesman and world-renowned radical journalist who has been locked up on Pennsylvania’s death row for more than a quarter century. After previously rejecting Mumia’s request to present evidence of his innocence, as well as a host of issues showing that he was railroaded by a racist court, the Court turned down Mumia’s request for a new trial. It upheld the 2001 ruling by a federal district judge that ordered a new hearing on the sentence, but limited the “choice” to the living hell of life imprisonment without parole ... or execution. This ruling demonstrates once again that there is no justice in the capitalist courts. Convicted in the 1981 shooting of Philadelphia police officer Daniel Faulkner, Mumia Abu-Jamal is innocent. He did not commit the crime of which he was accused. He was declared guilty and sentenced to die because of his revolutionary politics and because for years he had been a thorn in the side of the racist rulers of the misnamed “city of brotherly love.” Around the world, millions have come out in defense of Jamal. His eloquent writings exposing the crimes of imperialism have circled the globe, translated into numerous languages. Mumia is the symbol of the international struggle against the racist death penalty, inherited from the system of chattel slavery on which American capitalism was built. This latest ruling, like all those that preceded it, shows that the exploited and oppressed must have no faith in the racist injustice system. We call on the workers movement to mobilize its power to free Mumia now! Mumia’s original 1982 trial and 1995 appeal hearing were such grotesque racist shams that many liberals and reformists saw them as aberrations, placing their hopes in a new trial. In both cases, the proceedings were presided over by the notorious “hanging judge” Albert Sabo, a lifetime member of the Fraternal Order of Police (FOP), who sentenced more defendants to death than any other sitting judge in the United States. Sabo was a certifiable racist who frequently made clear his disdain toward the defense and vowed in the hearing of a court employee that he would “help fry the n----r.” He refused to admit evidence of state manipulation of eyewitnesses into changing their testimony to implicate Jamal, suppressed evidence of the shooter fleeing the scene, allowed the use of a fabricated “confession” cooked up months later by the prosecution, and ordered the jailing of defense attorney Rachel Wolkenstein for objecting to his blatantly prejudicial rulings. Yet it is not just one racist judge. The judicial system has repeatedly upheld the rigged trial and conviction of Jamal. State and federal courts have refused to admit the testimony of the man, Arnold Beverly, who confessed to carrying out the murder for which Mumia was convicted. The persecution of this champion of the oppressed is the result of a tight-knit ruling class determined to uphold the cops who enforce their “law and order.” This is illustrated by the fact that the Philly district attorney who oversaw the prosecution of Jamal, Ed Rendell, is now governor of Pennsylvania (and has vowed to quickly sign a death warrant if the sentence is reinstated), while his wife sits on the federal court hearing Mumia’s appeal. Although Jamal’s persecution began under police chief and later Republican mayor Frank Rizzo, Rendell is a leading Democrat. Democratic president Bill Clinton authored the 1996 Anti-Terrorism and Effective Death Penalty Act, which has hamstrung appeals by Mumia and others challenging the barbaric system of legal lynching. And while Hillary Clinton is a big FOP backer, her Democratic rival Barack Obama supports “the ultimate punishment” in particularly “heinous” cases, and sure as hell isn’t going to come out for Mumia, a former Black Panther who the cops are set on executing. Philadelphia District Attorney Lynne Abraham applauded yesterday’s federal court decision. While the local bourgeois press highlighted “Life term or new penalty hearing ordered for Mumia Abu-Jamal” (Philadelphia Inquirer, 28 March), Pam Africa of the MOVE organization rightly denounced the ruling as “a divisive, deceptive plot to fool people into thinking they had done something fair by Mumia.” An Inquirer article posted yesterday afternoon quoted Jeff Mackler of the Mobilization to Free Mumia Abu-Jamal saying “Today’s decision is a travesty of justice,” adding: “He said he had been hoping that the Third Circuit would order an entirely new trial based on the claim about racial discrimination in jury selection.” A vain hope indeed. “It is difficult to imagine that the systematic race and class bias that permeate America’s criminal ‘justice’ system could be set aside and that the nation’s most famed and innocent death row inmate and political prisoner of 25 years, Mumia Abu-Jamal, could win a new trial and freedom. The evidence of racist jury rigging in the Philadelphia courts is extremely powerful, including a “training video” for new prosecutors on how to exclude blacks jurors. Yet the Third Circuit judicial panel dismissed the whole issue because Mumia’s lawyer failed to raise it at the 1982 trial and because there was no evidence of how many blacks were in the jury pool, even though in previous cases the same court had held that there were no such requirements. The fact that Jamal’s conviction was upheld by this “liberal” court should dispel the idea that somehow the capitalist judicial system, and particularly the federal courts, can produce justice for the oppressed. This illusion permeated the liberal civil rights movement of the 1960s, leading it to look to the Democratic Kennedy and Johnson administrations for salvation. Yet it was under LBJ that the full-scale persecution of the Black Panthers began, carried out by his attorney general, Ramsey Clark, now a darling of the reformist left. Revolutionary Marxists educated in the school of Lenin and Trotsky, in contrast, understand that the bourgeois state in all of its facets is a machine for enforcing the rule of capital over oppressed racial minorities, immigrants, poor and working people. In fact, the railroading of Mumia Abu-Jamal is one more in a long string of frame-up trials including those of San Francisco labor leaders Tom Mooney and Warren Billings and hundreds of revolutionary syndicalists of the IWW in World War I; of anarchists Sacco and Vanzetti in the 1920s “red scare”; of the nine Scottsboro youths in Alabama who symbolized Jim Crow “justice”; of the Trotskyist leaders and Minneapolis Teamsters during World War II; of Ethel and Julius Rosenberg during the McCarthyite witchhunting at the height of the anti-Soviet Cold War. And it is part of the campaign of state murder against black radicals symbolized by the 38 Panthers gunned down by the police and hundreds who were jailed under the FBI’s notorious COINTELPRO program of disruption and provocation. 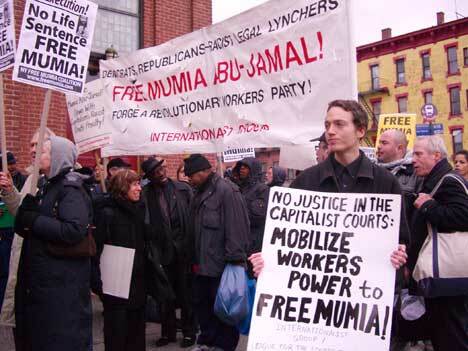 The Internationalist Group and the League for the Fourth International, of which the IG is the U.S. section, have fought since our inception to dispel illusions in the capitalist courts and instead mobilize the power of the workers movement to free Mumia Abu-Jamal. We seek to organize a revolutionary workers party against both capitalist parties of racist legal lynching and imperialist war. The LFI’s Brazilian section, the Liga Quarta-Internacionalista do Brasil, sparked the first work stoppage for Jamal’s freedom, called throughout the state of Rio de Janeiro on 23 April 1999, which was carried out in conjunction with a shutdown of West Coast U.S. ports the next day by the powerful International Longshore and Warehouse Union (ILWU). Currently, the ILWU has announced that it will stop work at all 27 West Coast ports on May 1 to protest the war in Afghanistan and Iraq.